1/3 C Brown Sugar] 2 T Chili Powder 1 T Paprika 1 t Garlic Powder 1 t Pepper Olive Oil Cooking Spray 2 bags Microwave Popcorn Mix together first 5 ingredients ahead of time. Once popcorn is popped, spray with cooking spray and toss with spice mixture. You may need to add salt if your popcorn is unsalted. Popcorn Kernels 1/4 C plus 1 T Rosemary Infused Oil, recipe follows 1/4 C Parmesan Cheese Stir popcorn kernels and 1/4 C of oil in a heavy large pot. Cover and cook over medium heat until kernels have popped, shaking the pot halfway through cooking, about 3 minutes. Immediately transfer the popcorn to a large serving bowl. Toss the popcorn with 1 T oil & parmesan cheese. 1 C Olive Oil 5 sprigs of Fresh Rosemary Combine the oil and rosemary in a small saucepan. Cook over medium-low heat for 5 minutes. Remove from the heat and let cool to room temperature. Transfer oil & sprigs into an airtight container. Refrigerate for up to 1 month. 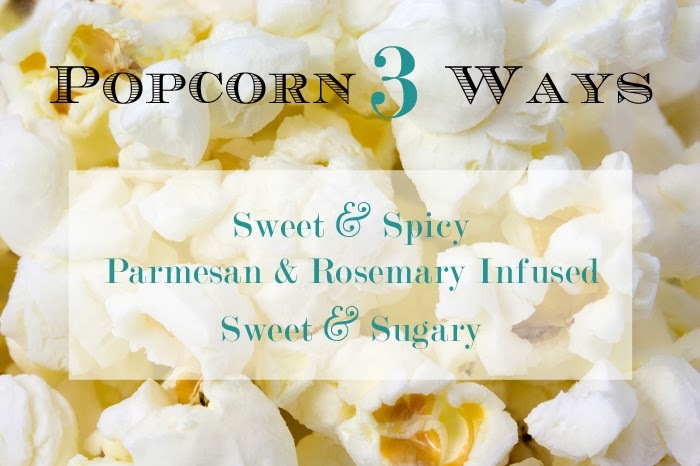 3 T Sugar 1 t Cinnamon Olive Oil Cooking Spray 1 bag Microwave Popcorn Mix sugar and cinnamon and set aside. Once the popcorn is popped, simply spray thoroughly with cooking spray and toss with cinnamon sugar mixture. You may need to add salt if your popcorn is unsalted. How do you like your popcorn topped?